4 days from £1455pp plus international flights. 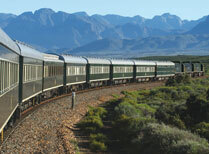 A classic rail journey from Pretoria to Cape Town on board one of the most luxurious trains in the world, South Africa's famous Rovos Rail. You'll travel the 1,600 kilometres in the finest style, pampered by unobtrusive staff and in full air conditioned comfort. Your Pullman Suite is a cosy, wood panelled refuge by night, and converts to a private carriage with a comfy sofa-seat by the window during the day. You'll have a private shower room and 24-hour room service. 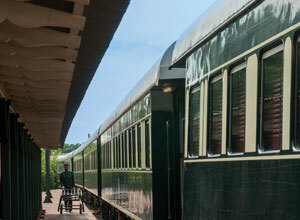 With lounge cars and a spacious observation car with large picture windows, there is plenty of space where you can relax, enjoy the company of other guests and admire the splendid scenery. 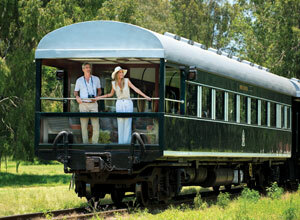 Meals are served in the elegant dining car, and give you the opportunity to savour the chef's fine gastronomy. Dinner is a splendid affair, with men donning jackets and ties and women in the finest evening dresses and jewels, sitting down to a candlelit meal. Interiors of polished wood and carpeted floors, with leather sofas, elegant light fittings and vases full of cut flowers add an air of refinement. Your journey is punctuated with stops at the famous diamond mining centre of Kimberley, now a museum and open air visitor centre, and the lovely historic village of Majiesfontein, a National Heritage site, founded in 1884 by the legendary Scottish railway man James Douglas Logan. Finally you'll pull in to Cape Town station's platform 24 at 6pm on day 3, ready for the next phase of your South African holiday. Your holiday begins as you touch down at OR Tambo airport in Johannesburg. After clearing customs and collecting your bags, step through the doors and one of our representatives will be there to meet you and drive you to your beautiful boutique hotel just outside Pretoria. You can spend the day relaxing by the pool, enjoying views from the terrace, catching up on sleep or you may choose to explore Pretoria, the city of Jacarandas. 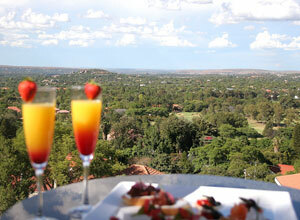 The hotel offers excellent international cuisine which can be preceded by drinks on the terrace as you overlook the city. Price notes: 2019 guide price pp sharing: Jan-Sept: £1,455. This holiday starts in Pretoria and ends in Cape Town. It can be taken on its own or as part of a longer holiday in South Africa. Return flights from the UK start from around £850, depending on season and availability. Departure dates: There are between 4 and 8 departure dates each month. Please ask us for more details. 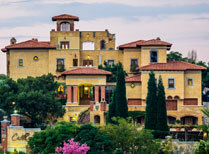 The Winelands is an area of vineyards, striking mountains, excellent food and fun. An area steeped in history where some of the most excellent New World wines are produced.